In 1969, when Bratt was five years old, American Indian activists seized control of Alcatraz Island, an abandoned prison in San Francisco Bay. The prison had been closed for six years, but a long-ignored treaty stated that natives could claim any unoccupied federal land. Bratt's mother, a Quechua Indian from Peru, wasn't in the first landing party of Indians who took the island, but she arrived the next day, with Benjamin and his siblings. Before and after his time on Alcatraz, Bratt grew up in San Francisco, where he still lives. His parents were divorced, and Bratt was mostly raised by his mother, but as a teenager he lived with his father for several years. Bratt studied acting for six years, and eventually landed the role of Detective Reyaldo "Rey" Curtis in the cop drama Law and Order. 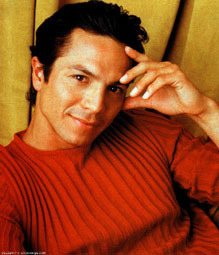 The character's mestizo ancestry, a mix of Latino-Indian and German backgrounds, was the same as Bratt's. Bratt was terrific in Red Planet, directed by his brother and touching on Native American issues both Bratts clearly feel strongly about. He was also excellent as poet Miguel Pinero in the 2002 film Pinero, but almost nobody saw either film. His more popular films include Miss Congeniality and Traffic. His grandfather, George Bratt, was a semi-famous Broadway actor in the 1920s and 30s, appearing with James Cagney and Sydney Greenstreet in The Dybbuk and The Little Clay Cart.